Ah, Metro, how we love thee. After listening for months now from Catoe and Co go on and on about how dire Metro’s situation is, how much money they’re short, and how “woe is ME(tro)” – despite a record-breaking Inauguration ridership day and many other top-10 rider days last year AND a fare hike last year, to give Metro more of our money to play with – they do this. Seems our near-broke and needy transit system is going after the stimulus monies now. Anything to fill that $154M gap, eh boys? (Oh, wait – the list of projects total about $230M. Well, when reaching deep into our pockets, why not go all the way?) On the list is nearly everything WMATA cried about last year, including the track maintenance warnings, replacing old buses and platforms, increasing SmarTrip services and so on. I’ll give Catoe and Co credit; it’s a ballsy move to take your ‘needs’ list and try to siphon stimulus money for it by couching it in the “let’s help the economy now” phraseology so popular on the airwaves today. Hey, everyone else is doing it, so why not WMATA? There is money specifically ear-marked for transit, wouldn’t it be irresponsible of Metro to not go after some of it? Especially when the best use of stimulus is shovel-ready projects and Metro has so many lined-up? And you may want to rethink your snark about Metro financial mismanagement. Metro is 2nd only to NYC in fare-recovery (aka, fares pay for a higher percentage of Metro’s costs than they do in any other transit system in the U.S. except NYC). The problem with Metro is not that they are insufficiently efficient, it is that they are poorly funded. Every other major transit system in the nation has a dedicated funding source that they can count on and plan around, Metro doesn’t. I’m with Chris. WTF? This money is specifically meant to do things like “replace crumbling platforms” or buy buses. Uh, you know, spending money. To stimulate. I’m not against the project list. I’m against how Metro is conveniently using the stimulus package to pay for things that they’ve already had on their books to do – but couldn’t do thanks to some financial “hardships”: poorly planned budgets, underfunding, excessive ridership, whatever their excuse of the month is. They’ve gone on long and loud about not having the money (and yes, MD and VA need to pony up their share) and yet are exceptionally reluctant to enact cost-saving measures to fix the financial leakage so they could do these things in the first place, such as reducing inflated salaries, cut or reduce services that aren’t profitable, etc. Using the stimulus money to do it is fine; but from where I sit, they’re using it only to cover their butts – free money will basically allow them to continue with their poor financial practices until the ‘next crisis.’ That’s my issue, stimulus bill opinions aside. Poor financial practices don’t get you the 2nd highest fare recovery in the nation, and good luck having anything but a “poorly planned budget” when your funding is completely unpredictable and the funding agreement forbids you from saving any money for a rainy day. 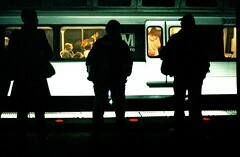 Metro’s not perfect, and any sufficiently large organization is going to have its problems (don’t get me started on their unwillingness to release their scheduling data) and inefficiencies, but in my opinion, by and large they’re doing quite a good job with the crap hand they’ve been dealt.